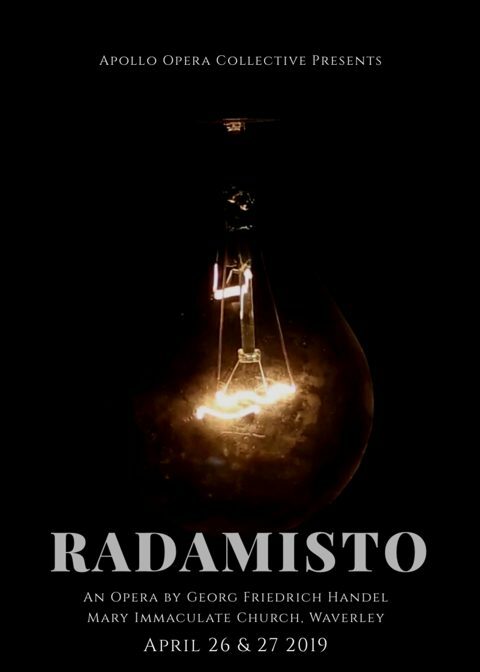 The Apollo Opera Collective returns to Mary Immaculate Church to perform Handel’s Radamisto. AOC provides performance opportunities for talented young singers to hone their craft in a fully staged performance. The Apollo Opera Collective was launched in 2017 as a young artists’ opera company, dedicated to providing performance opportunities to talented young singers and instrumentalists at the beginning of their careers. The best way to hone your craft as a musician is to perform, and Apollo aims to present one fully staged opera per year in a production that is entirely driven by the young artists themselves. We realised our goal of presenting our very first performance in April 2018, and now we want to continue the great work we’ve started. This project is important because it provides a platform for young artists to develop their talents and hone their craft. Performance opportunities in Sydney are few and far between, and the chance to perform a full role in a staged opera is even rarer. We also aim to run the company as professionally as possible on a very tight budget. Most of our singers juggle several jobs as well as their singing career, so we want to make sure that the extra time they are dedicating to Apollo is most beneficial to them. Singers from our first performance of Ariodante have already been able to use the experience they gained to secure positions in summer schools overseas, allowing them to take the next step in their careers. The project is also important because of what it adds to the Sydney arts scene. Radamisto is widely recognised as a masterpiece, but is rarely performed. By supporting this project you will be helping to create a vibrant and rich performance culture in Sydney. Every cent will be put towards creating a unique and special theatrical experience for you, and a valuable chance to develop as artists for us. The Apollo Opera Collective is a new opera company formed to provide performance opportunities to young opera singers, instrumentalists, directors and theatre technicians. The best way for young artists to hone their skills is through performance, and Apollo aims to provide the platform for these artists to develop the expertise needed to launch their careers. The company is entirely driven by the artists themselves, who work collaboratively on all the different aspects of staging opera performances.